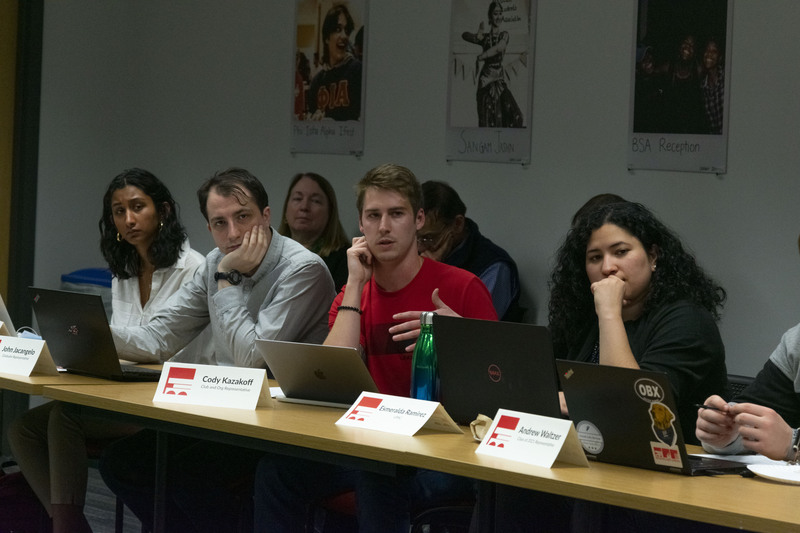 In a four-hour meeting, the Executive Board saw a historical 32 motions, heard presentations from nine different clubs, approved amendments to their own Bylaws, and altered room assignments spanning all three floors of the Union. Following presentations from President of the Union Justin Etzine ’18 G’19, the Board heard 12 of the night’s motions. The majority of these were related to a facilities proposal entitled the “Dominoes Project” which comprised of 11 different reallocations of Union clubs and businesses. These reassignments spanned all three floors and included nine organizations, including the Photography Club, UPAC, Systems Administration, the Clubhouse Pub, The Polytechnic, RPI TV, Ben & Jerry’s, the Campus Unisex Hair Salon, and Multicultural Affairs. For their annual Ballroom DanceSport Competition being held at the Troy Boys and Girls Club on Sunday, March 24, RPI Ballroom Dance asked the Board for an approval of up to $2,000 for “bargaining power” when negotiating with videographers. Though the club had initially decided on a vendor, new negotiations were necessary due to an undisclosed issue that made both the club and Board members feel that the vendor was inappropriate to continue working with. The team recounted that they had reached out to multiple videography providers on campus, including RPI TV, and none were available for their event. During discussion, the Board came to the conclusion that since $2,000 is just under a third of the remaining club contingencies budget, it would be safer to postpone the approval and instead allow for the club to pursue negotiations with both Institute and outside vendors, then allow the Board to hold an electronic vote to approve the final price later in the week. The vote to postpone the motion passed 13-5. UPAC General presented to the Board a request to reallocate $490 to fund “several small events throughout the remainder of the semester.” A list of the proposed events was provided to the Executive Board, and included programs that provided free waffles and stress relief. The list also included an Ides of March event on March 15 which would allow participants to throw darts at a cardboard cut-out of Julius Caesar, and an event on April 20 distributing free brownies. It became clear that the majority of the Board felt uncomfortable funding the two latter events, and after an informal straw poll of the room, the motion was ruled out of order and rewritten. The new motion specified the approval of all events other than those entitled “Ides of March” and “Brownies” which were “denied and may not be pursued even if funding is found elsewhere.” The second motion was unanimously approved. The Board saw requests from clubs Lavender Ambassadors and Active Minds for starter budgets. Lavender Ambassadors is an LGBTQ sensitivity training focused club and asked for $92 for general use, including food for meetings and tabling. Active Minds promotes mental health awareness on campus, and asked for a starter budget of $250 for purposes such as office supplies, small events, and promotional social media giveaways. When the Board expressed concerns about funding for Active Minds, a club with only seven members, a Club Operations Committee member sitting in on the meeting said, “They had one of the best recruitment plans I’ve ever heard.” Both clubs were unanimously approved for their budgets, making them Union-funded clubs. Though they’ve been an operating club since 2016, Team RPI E-Sports, an online gaming club, was not a Union-affiliated organization until their proposal to the Board. They reported approximately 400 members in their Discord server, of which only 250 are Rensselaer students. This raised the issue that, according to policy, only five percent of club members can be non-students. The club responded that most of the non-student members contribute very little to the club and only attend large, open games. The president assured the Board that the Eastern College Athletic Conference Competition teams consist solely of RPI students, and that the only active members that are not students are alumni, who “fill in if we need it for a competitive scrimmage, like a practice, or give a little bit of coaching,” but they never participate in formal competitions. The Board eventually came to the conclusion that because of the open, online nature of the club, E-Sports could be exempt from the five percent community member policy but may not surpass 20 percent non-student membership. The vote to make them a Union-recognized club passed unanimously, and the vote to exempt them from policy passed 17-1-0. The Polytechnic came in front of the Executive Board to request approval for the use of Flytedesk, a business management service. Having heard a pitch for the service at a recent media convention, the club believed the service would allow for easier advertisement managing, as businesses would be charged through the site and payments would go through credit cards. This would abolish the need for personally mailing invoices, which the club has had difficulties with in the past. The Board approved use of the service pending Institute approval unanimously. In an effort to reform their process to increase project quality and interest, Engineers for a Sustainable World proposed a new program to the Executive Board called “Project Development Team.” Engineers for a Sustainable World is a problem-solving club on campus, dedicated to using engineering to create real world projects to solve specific issues. The Project Development Team would focus efforts on finding new projects for the club to research, and the club outlined many benefits of the team in their presentation. The program was approved with unanimously. The Executive Board also approved the merging of clubs and Union Programs and Activities Committee subcommittees UPAC Lights and UPAC Sound into one administrative organization, “Union Show Techs.” This also made members of Union Show Techs student employees of the Union, meaning their services would no longer be paid for by clubs. The Board also approved amendments to its own bylaws. These included the creation of three new non-voting vice president positions, the addition of an appeal process to the 2.5 minimum GPA requirement to serve on the Executive Board, and several other smaller changes intended to increase accountability and accommodate for the Arch.